National Coffee Milkshake Day is celebrated every year on July 26. A refreshing caffeinated beverage is a perfect drink for a warm summer day. A coffee milkshake contains less caffeine than a regular iced coffee so it is more kid-friendly. Milkshakes have been around singe 1880s. Originally they contained whiskey, but by 1900 milkshakes became non-alcoholic. A milkshake is typically made from milk and ice cream with added sweeteners and flavorings. 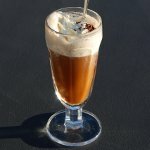 Coffee-flavored milkshakes are made with brewed coffee, instant coffee, coffee-flavored ice cream, coffee syrup, or coffee liqueur. A coffee milkshake tastes especially good when made with cold-brewed coffee. The process of cold brewing is quite simple. You need to combine coarsely ground coffee with cold, filtered water and let it brew for at least 8 hours. Before making your milkshake, strain the coffee to get rid of the excess grounds. To make a coffee milkshake, blend 1 cup cold-brewed coffee, 4 large scoops vanilla ice cream, and 1 tbs chocolate syrup together until smooth. If the mixture is too thin, add more ice cream. If it is too thick, add some milk. Pour the milkshake into a glass and top with whipped cream. You can substitute cold-brewed coffee with chilled regular coffee, but keep in mind that regular coffee is stronger.